What are his best recent works? I heard something last month that sounded much better than the Glass I used to passionately avoid. Various concerti and the 8th and 9th symphonies. 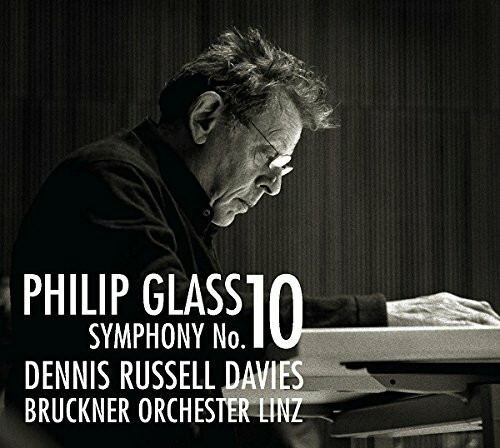 Philip Glass was interviewed on NPR's Fresh Air on Monday. This is some cruel parodist's merciless assault on Philip Glass. He should sue for defamation. You know I'm a Glass fan. I love some of the early symphonies, piano pieces, Fog of War, The Hours...but this is not good. Especially "Concert Overture," which might be the worst Glass I've ever heard, infused as it is with so much cloying sentimentality. He has spent too long in Hollywood. I read positive and negative comments when the symphony premiered a few years back. And again with the recording I'm reading positives and negatives. It seems to be a trend with Glass' new music. But I'm always up for the challenge. Here's hoping I like NEXT month's new Philip Glass CD a lot more than I liked LAST month's Philip Glass CD! "Philip Glass’ Fifth String Quartet is the most substantial of his five quartets and the most traditional, using formal structures and expressive contrasts which go far beyond minimalism. While maintaining Glass’ unmistakeable personal style, this is a quartet which delivers both driving energy and an unforgettable, threnody-like tenderness. Glass chose a string quartet for his score to the film Dracula to ‘evoke the feeling of the world of the 19th century’, the music underpinning the film’s visual drama while avoiding obvious ‘horror’ effects. The String Sextet is an arrangement of Glass’s Third Symphony (Naxos 8559202), combining symphonic scale with the intimacy synonymous with the chamber music genre. The Carducci Quartet’s critically acclaimed recording of Philip Glass’s String Quartets Nos. 1-4 can be heard on Naxos 8559636." Well, Symphony No. 3 and Dracula are two of my favorite Glass pieces, so this CD is looking good so far! Petition to officially change the name of this thread to "Glass Houses". BUT NOT the Harpsichord Concerto. I agree re the 8th and 9th symphonies, and I'll add the 10th to that. His best concerto out of the recent ones I've heard is probably the first cello concerto. He seems to be in a good period of writing orchestral music at the moment, which is pretty cool. I like orchestral music. I like Shards of Glass....but maybe something on a bigger scale, like glass skyscrapers/buildings or something like that? You and Brian can have a cage fight over the 10th. I have yet to hear it. Brian hated it enough to encourage my hopes. And he still hasn't apologized to John for expressing that opinion on this thread either. Wait, I am mistaken, I meant no. 7, couldn't remember if I was thinking of the one before those two or after. I saw the Philip Glass ensemble, with the composer himself on keyboard, perform the piece in front of screen displaying the film. An all timer event for me. One of my freinds saw Einstein on the Beach last year!